As AI, ML and IoT technologies converge; organizations are shifting the focus of Incident Response Lifecycle Management (IRLM) from simply monitoring and responding to process disruptions to placing greater emphasis on monitoring and improving the customer experience. 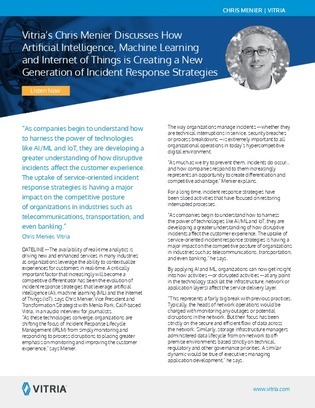 The way organizations manage incidents is extremely important to all organizational operations in today’s hypercompetitive digital environment. In this resource, Vitria’s Vice President, Chris Menier discusses transformative IRLM and how Vitria can help support your organization’s transition.